Espurr in game: 3,700 Who? Important notice! Pokemon Espurr is a fictional character of humans. Espurr (Japanese: ??? ?— Nyasper) is a Psychic-type Pokémon introduced in Generation VI. It evolves into Meowstic starting at level 25. 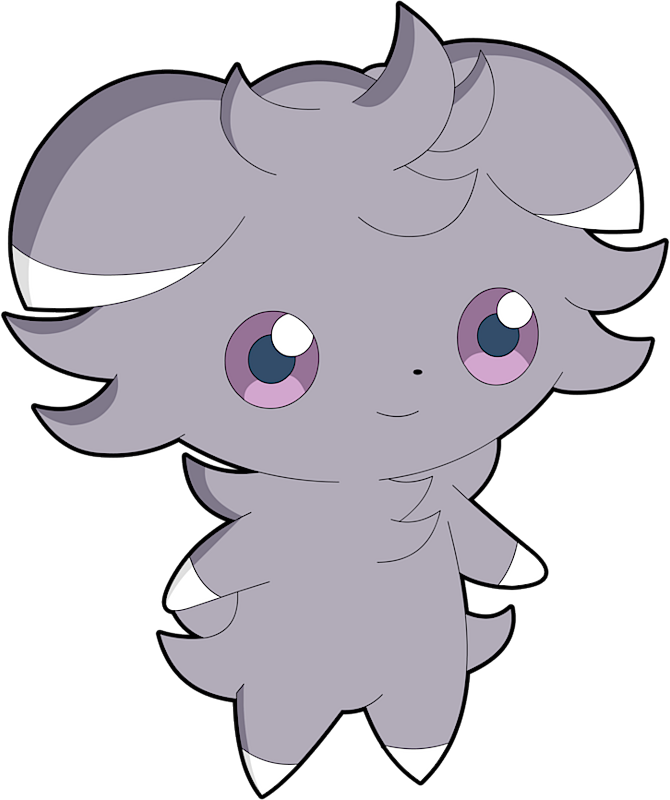 Espurr is a small, bipedal, feline Pokémon. Its fur is mussed and a pale grey color with the exception of its ears—which are cream-rimmed—and its paws, which have short cream socks. It has wide, annular lilac eyes with darker purple pupils. It has a small, triangular nose and tiny mouth. It has a small, fluffy, slightly curled tail. Its ears, quite large in proportion to its body, are folded- beneath them are two ring-shaped buff-colored organs. These organs emit Espurr's intense psychic powers, and said power would leak out were the ears not sheltering the organs. When its mouth is open, two pointed teeth can be seen on its upper jaw. Espurr are solitary in the wild; they act on their own and each values its independence. An Espurr appeared in Seeking Shelter from the Storm!. A Trainer's Espurr appeared in Summer of Discovery!, Foggy Pokémon Orienteering! and even in a picture in Battling Into the Hall of Fame!. An Espurr appeared in Day Three Blockbusters!. Two Espurr, currently Meowstic, appeared in a flashback in Splitting Heirs!, under the ownership of two brothers, Blake and Heath. An Espurr appeared in The Future Is Now, Thanks to Determination!. A Trainer's Espurr appeared in A Performance Pop Quiz!. An Espurr appeared in Cloudy Fate, Bright Future!, under the ownership of a Psychic. An Espurr appeared in Party Dancecapades!, under the ownership of a Pokémon Performer participating in a dance party. Three Espurr appeared in Volcanion and the Mechanical Marvel. A Trainer's Espurr appeared in The First Day of the Rest of Your Life!. A Trainer with three Espurr appeared in Kalos League Passion with a Certain Flare!. XY014 Espurr Ash's Pokédex Espurr, the Restraint Pokémon. Espurr's Psychic energy can travel hundreds of feet, blasting everything around it. 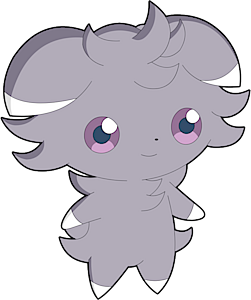 Emma's Espurr, nicknamed Mimi, appeared in The Investigation. It accompanied Looker on a search of Lumiose City as he was searching for Essentia. Mimi's affection towards Essentia provided the proof for Looker that she was Emma in disguise, and Mimi later led him towards her. Espurr debuted in Kangaskhan...Kangascan't, where a trainer's Espurr appeared by the fountain in Santalune City. A Team Flare Grunt used four Espurr with different expressions to stall Y, Tierno, and Shauna. Cassius arrives and helps the three with his Gourgeist, capturing three of them. 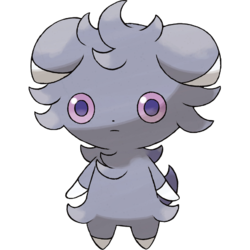 Later, Emma had found the last Espurr, who had gotten confused, and nicknamed it Mimi. Pokémon X and Y: Emma's closest friend is an Espurr she named Mimi (Japanese: ??? Moko). It helps Emma, Looker, and the player several times during the Looker Bureau sidequest. Pokémon Super Mystery Dungeon: Espurr is one of the students who live in Serene Village. She is clever and reliable. Moves marked with a superscript game abbreviation can only be bred onto Espurr in that game. For other sprites and images, please see Espurr images on the Bulbagarden Archives. Espurr is the only Pokémon with a base stat total of 355 that is not restored from a Fossil. Espurr appears to be based on a kitten, particularly the Scottish Fold breed due to its curled ears and lilac coloring. It may also be inspired by nekomata, who can come from cats who live many years until their tail splits and they gain supernatural powers, much like when Espurr evolves into Meowstic. Espurr is a combination of ESP, esper, and purr. Nyasper may be a combination of ? ?— nya (onomatopoeia of the sound cats make) and esper.